Summary: - Size 8 AU - I'm 167cm tall and weigh 60kg. - French Lace - Corset back - allows for changes in size. 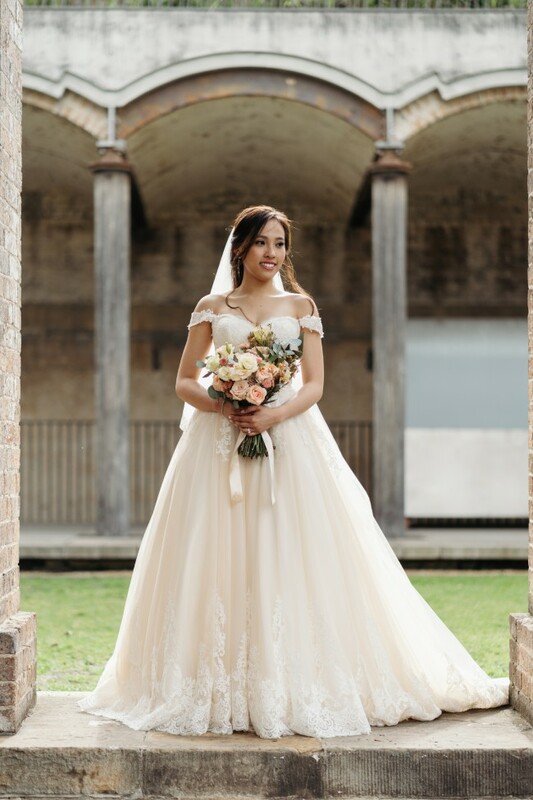 - Peach / Champagne colour - coloured tulle can be removed if you prefer white - Detachable Sleeves - Bustle on dress - to transform dress from train to no train. - Includes a laced veil worth $600. - One and only. Feel like a princess on your wedding day with this amazing dress with delicate French Lace. This dress is a standard size 8 dress. Nothing had to be altered from the standard size 8. I am 167cm tall, and weigh 60kg, on the day, I wore a heel approximately 3 inches tall. Because of the corset back, you can be bigger or smaller in size and would still fit in nicely. It also gives you the flexibility of losing weight and putting on weight before your wedding. With all the stresses leading up to the wedding, losing weight or gaining weight before your wedding should be the last thing you have to worry about. I actually gained some weight before the wedding and the corset still tied it all in nicely. I had so many compliments on the day, and i believe that if you got this dress, you will get lots of compliments too! The dress is one and only as i customised the dress to my own preferred colour. It's a little bit like a peach/champagne colour. Only 1 layer is a peach tulle. There are approximately 10 layers. If you don't like the champagne colour, you can always remove the tulle layer easily. On the other hand, the off the shoulder sleeves are detachable. I detached it when doing my first dance so that I can lift my hands up. But, it can be re-attached during other parts of the day to give you a dual look.